KIM YUAN Gloves, committed to providing each customer with the highest standard of customer service. If you have any issue with our gloves at any time, please always contact us first before leaving feedback/review. We will strive to fix the issue to your full Satisfaction Guaranteed. If the gloves are defective or damaged within 90 days, we will replace it for you or provide a full refund so can feel confident purchasing with KIM YUAN. ✔The glove's secure wrist closure can keep dirt and debris out of your hands when you doing outdoor work. ✔The glove's reinforced palm patch and flexible texture gloves can provide superior grip and skin protection when you get something sharp or slippery. ✔The glove's reflective strips can effectively reflect light and let others noticed you when you working at night or in the dark. ✔The glove's full fingers touch function make you easily to answer the phone or check the information at busy working. Unisex gloves, ideal for warehouse, shooting, gardening, yard work, climbing, fencing, landscaping, carpentry, lumber, stonework, construction, motorcycle riding, heavy truck driver, demolition, ranching, cutting, farming, hunting, machinery and so on, it is a perfect tool for all type of work. ♥ Washing instructions: water and detergent cleaning, and then let it natural withering, don't let the sun exposure. ♥ Avoid contact with some organic solvents. ★ HIGH-QUALITY SYNTHETIC LEATHER PROTECTION ▶ Synthetic leather provides extremely excellent abrasion resistance, cold resistance, air permeability, and aging resistance.If you have any type of outdoor tasks to do these are the gloves you need, they are both comfortable and rugged enough that you only need one pair, and it will last long. ★ COMFORTABLE TO WEAR ▶ Secure wrist closure design will keep dirt and debris out of the inside of the gloves， and the inside would not prick the hand, it gives you a natural & flexible experience. ★ EXTRA FEATURES ▶ Touch screen function - just need a light touch to answer calls when in busy work, Thumb terry cloth - Instantly wipe out sweat when working or exercising, Reflective strips - Each glove is equipped with two reflective strips to protect night work safety, Double layered palm protection - relieves pressure from carrying heavy objects. 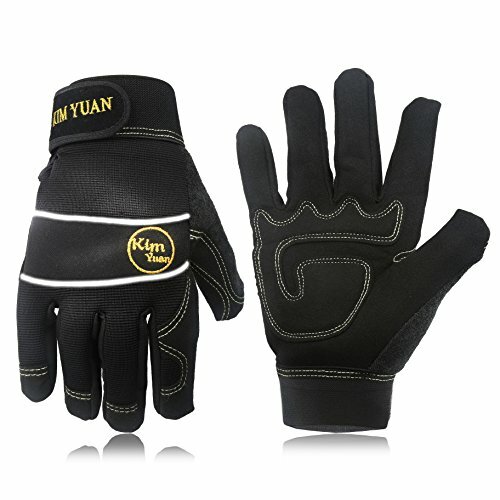 ★ WIDE RANGE APPLICATION ▶ This glove features and excellent quality make it useful for Warehouse, Construction, Yard, Shooting, Motocycle Driving, Gardening, Fence Fix, Trucking, Heavy Duty Work, Camping, Ranch/Farm, Landscaping, Diy, Garage, Moving, Grinding, Chopping, Mulching, Digging and any heavy or outdoor work. ★ PROFESSIONAL MANUFACTURE ▶ Kim Yuan has more than 20 years of experience in the production of work gloves, so we know how to select High Grade materials to make High Quality working gloves, we are confident that these gloves can be compared with the similar gloves in the market. If you have any questions about this product by KIM YUAN, contact us by completing and submitting the form below. If you are looking for a specif part number, please include it with your message.